We provide a number of automated tests and tools that you can use to test your implementation. The tests for chiTCP are built by following the instructions in Building. While this will build several test programs, you will only have to use the test-tcp executable. Make sure you re-build chiTCP any time you change your code, to make sure the test-tcp executable is testing the latest version of your code. Optionally, you can include the --verbose option to see the progress of each test. However, you should not do this until your project is nearly complete: most of the tests will fail by timing out and, given the high timeouts necessary for some of the tests, the above command can take a long time to run on an incomplete project. Instead, you should run the tests individually or by category. This means that the test did not finish running by some specified timeout (in this case, 0.5 seconds). This usually means your code has gotten stuck somewhere, and is not sending a packet that the tests were expecting. When a test fails or times out, you will need to dig deeper to see what your code is doing during the test. We provide several mechanisms for you to do so. To produce a grade report (showing how many points were scored in each test), run make grade in the same directory where you built chiTCP. Make sure you do so after running the tests (make grade will not run the tests for you; it will simply analyze the test results, which are saved to a results.json file by default, and determine your score based on that). Note: make grade will still work if you ran the tests just for a subset of the tests (e.g., by selecting just one category). In this case, any test that was not run will be reported as scoring zero points. Parsing through all the detailed logging at the DEBUG and TRACE levels can be overwhelming, and it can be hard to sift through so much information. You should first try using chiTCP’s MINIMAL logging level (the messages at this level are generated directly by chiTCP; you should never call chilog with this logging level). The MINIMAL logging level will log any changes of state in a socket, as well as any packets received and sent by a socket (including important information about the packet, like its sequence number, the size of the payload, etc.). The format is compact and intended to be easy to read. You should ignore the column containing tcp-socket-0, network-layer-0, etc. Instead focus on the [S0], [S1], etc. which tells you what socket is producing this log message. The log message can be either SENT (the socket sent a packet), RCVD (the socket received a packet), a state transition (two states separated by ->, or a message indicating that a passive socket has spawned an active socket. Whe a packet is sent or received, the log message will include the source IP and port, the destination IP and port, the flags in the TCP header (S: SYN, F: FIN, . : ACK), the sequence number, the acknowledgement number, the advertised window size, and the payload length. Please note that the sequence numbers are likely to be different that shown in the above output, depending on how you set IRS and ISS. The DROP_RCVD message indicates that chiTCP simulated a dropped packet, and TIMEOUT indicates that a TCP timeout has happened. Instead of reading through the log output, it can be useful to analyze the packets that were actually sent during the test. chiTCP can produce a “pcap” file that can be opened with Wireshark. This can help you verify whether all the values in the TCP packets are set to the correct values, since Wireshark will “dissect” your TCP packets just like it would any TCP packet (and will highlight any issues). ./test-tcp --debug=gdb --debug-transport=tcp:PORT --filter "TEST"
Replace TEST with the test you want to debug, and substitute PORT with a random port number. By default, the tests will use 1234 but, if you are on a machine with multiple users, other users may be trying to use that port. Substituting PORT with the same port you used earlier. Replace TEST with the test you want to run. The automated tests will barrel through all the steps involved in each particular test, which can make it hard to observe what happens at each point. When you start developing your TCP implementation, we suggest you use the echo-server and echo-client sample programs if you need to run through your code step by step (these sample programs will be built when you run make). echo-server and echo-client are a basic implementation of an echo server and client. The echo server creates a passive socket on port 7 and, when a client connects on that port, every byte the client sends will be sent back verbatim. It is a simple way of testing that basic operations, like connecting or sending small messages, work correctly. Take into account that echo-server and echo-client both use the chisocket library. This means that you must run chitcpd on the same machine you’re running echo-server and echo-client. Otherwise, the chisocket library will not work. After that last message, the server will block, waiting for connections. If you do not get the same message back, an error message will be printed. Once you press any key, this will make the server stop listening on port 7. The echo client and server can still be cumbersome for testing since they require running three different programs (chitcpd, echo-server, and echo-client) and staying on top of how each of them behaves. Socket 1 is the active opener, and Socket 2 is the passive opener (note: sometimes the active opener will get Socket 0). Although you may see different values for the Initial Sequence Number, the relative progression of the TCP variables should be the same. Similarly, the order of the state transitions may be slightly different than shown above. We provide a Wireshark dissector, in the wireshark_dissector directory, that you can use to easily see what is actually sent through the network during a chiTCP connection. Please note that, if you need to look at the packets sent during a given test or communication, producing a pcap file is generally enough. However, if you need to go further down the debugging rabbit hole, and see exactly what is being sent on the network, you can use this dissector to actually look at the chiTCP traffic. Since, as far as Wireshark is concerned, the ChiTCP packet is application-level data, we need to use a specific port so Wireshark will know what TCP packets contain ChiTCP packets. The default is 23300, although this can be changed in chitcp.lua. Wireshark should automatically detect the new dissector. If you capture TCP packets, it should flag non-empty packets on port 23300 as ChiTCP packets. 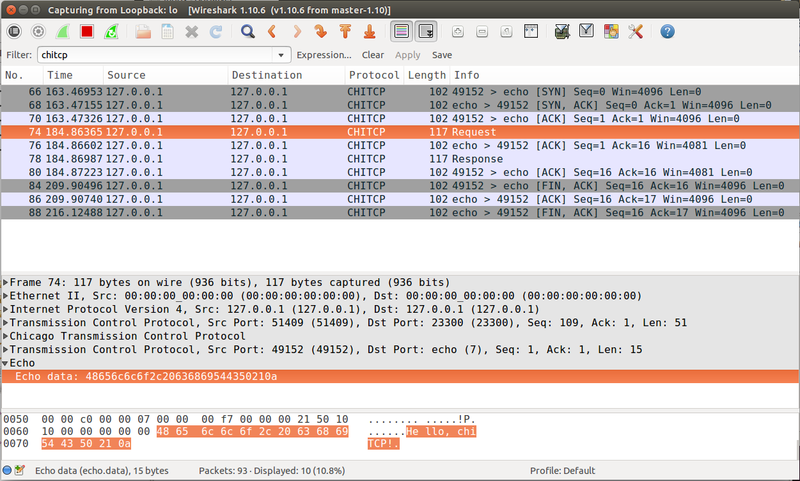 You should be able to see the ChiTCP header fields in human-readable format right below the TCP packet data. 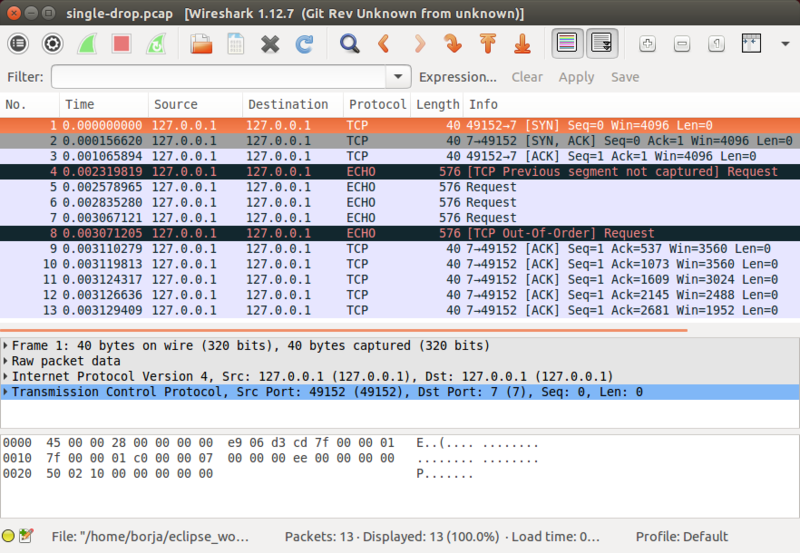 Wireshark will also helpfully dissect your TCP packet as well as its payload. Note how you can also apply the filter chitcp, and that will show only the TCP packets that contain ChiTCP packets.